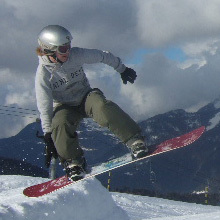 Snowboarding has grown massively in popularity across Europe in recent years. Les Gets and the other Portes du Soleil resorts have developed their slopes to offer some fantastic pistes and specialist areas for Snowboarder. There are now 9 Snowparks, a Superpipe and a specialist area called ‘The Stash’ offering natural jumps, rails and obstacles. The mountains around us offer every terrain imaginable – gentle wide open pistes, long steep descents and spectacular off piste routes. Intermediates can take their first air on the friendly beginner parks in Les Gets, Morzine and Avoriaz which offer a progression of jumps, boxes and rails. There are boarder cross trails to race down and to practice your technique. Or just take your time and get some great photos! Les Gets also has a boardcross track designed by Olympic World Champion Deborah Anthonioz and a brilliant snow park on the Mont Chery mountain area. For more advanced snowboarders we can also arrange day trips around the Portes du Soleil to take on the challenge of the PDS tour encompassing all 12 resorts (Les Gets, Morzine, Avoriaz, Chatel, Torgon, Morgins, Champoussin, Les Crosets, Champery, Abundance, Montriond and St Jean D’Aulps) dropping in and out of France and Switzerland. You can also take on the most demanding piste in the Portes du Soleil, known as ‘The Wall’. Starting high up on the mountain peak at the top of Avoriaz you have to quickly make solid turns around the hugh snow moguls on very steep terrain. Finishing at the bottom in Switzerland you can then celebrate with a Swiss hot chocolate, before trying your luck using the Swiss Tbar lift systems!